That's one finding of an internal report by Canadian Heritage, which is also funding a major think-tank review of the newspaper industry to examine whether Canada's laws and policies affecting the news business need revamping. The March 2016 Canadian Heritage report, Newspapers in Canada: The New Reality of a Traditional Industry, notes that the federal government has been abandoning print newspaper ads just as quickly as other advertisers, choosing cheaper digital ads instead — and disrupting the familiar newspaper business model. "Federal advertising is shifting towards online platforms," says the report, written by public servants and obtained by CBC News under the Access to Information Act. "Between 2008-09 and 2014-15, the proportion of ad spending fell by 96 per cent for daily newspapers and 31 per cent for community newspapers while increasing by 106 per cent for the internet." The research cites a litany of the financial woes of traditional newspaper companies, which have downsized newsrooms as revenues tank, eliminated Sunday editions, outsourced printing, and shuttered venerable papers. The report also notes there is "no formal policy framework in place to support the newspaper industry." It raises questions about whether digital disruptions in traditional newsrooms are leaving Canadians ill-served for news and information, and whether the federal government has a role to play in improving things. The document notes a 1965 section of the Income Tax Act, which gives preferential tax breaks for ads placed in Canadian print newspapers, is silent about digital platforms "meaning expenses for ads placed on foreign sites such as Facebook and Google can be deducted by Canadian advertisers." Other sections of the 46-page document refer to Canada's foreign-ownership rules, competition policies, and federal publishing funds, as policy tools that could be brought into play. 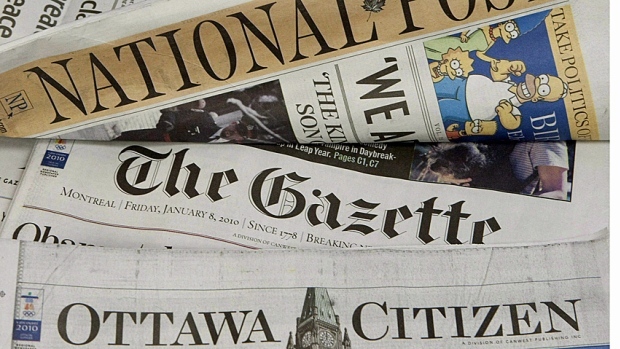 "Competition from foreign industry giants and news consumption preferences of new generations, based on personalized features, could reduce the number of Canadian dailies and the availability of local content in the near future," the report warns. "Public and industry concerns will probably grow in light of future closures, and the number of voices requesting governmental actions could become significant." The report echoes the warnings of a related March report from Industry Canada, also obtained under the Access to Information Act, that notes "Canada's newspaper industry is forecast to contract at an average annual rate of 5.2 per cent over the next five years." Both documents underpinned a decision last spring to hire a think-tank, the Public Policy Forum, to carry out a $270,000 study entitled "Changes in the newspaper industry," with conclusions to be delivered by Dec. 31. The heritage and industry departments are each contributing $100,000, while the forum and its partners are providing the rest of the funding. Forum president Ed Greenspon, a veteran journalist and editor, is spearheading the project, which includes six roundtables across the country, as well as focus groups and polling. "The question here is not: 'Are news organizations doing well?' We know news organizations are not doing well," he said in an interview. "The question is: Is democracy doing well?" Ottawa's contract asks the Public Policy Forum to "identify potential options that address challenges in the emerging news media landscape, with a particular focus on newspapers, and what actions could help facilitate positive growth that meets the needs of citizens, markets, journalists, and civil society." With the project nearing the halfway mark, Greenspon says he has already heard complaints from ethnic and community newspapers that federal advertising has shifted to the web and away from their pages. But he says increased federal ad spending is unlikely "to change the trajectory of events." There are also voices raising the possibility of tax-law changes to encourage Canadian foundations to financially support some kinds of news gathering, such as business reporting, he says. "One of the great concerns of the young digital companies is [that] if there is to be some form of policy, that the policy not favour the entrenched interests against their ability to create viable organizations," Greenspon added. Christopher Waddell, a veteran reporter and associate journalism professor at Carleton University in Ottawa, has attended one of the roundtables. He also says that if government has any policy role, it should be to encourage newcomers. "More focus should be spent on trying to promote people with new ideas that want to get into the industry than to try to keep the existing people where they are," he said in an interview. "What can be done to encourage investment in media industries?" A spokesman for Canadian Heritage Minister Melanie Joly, Pierre-Olivier Herbert, declined to comment on what policy options the government may be considering, saying "the process for the study is ongoing."